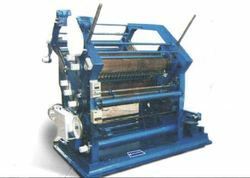 We offer a comprehensive range of Single Face Paper Corrugating Machines that are manufactured employing latest technology and quality components, which helps in easy changing of flute rolls. Their unique design makes them highly suitable for manufacturing 2 ply paper corrugated boards efficiently. The fair pricing, further makes them true value for money. Motorized self loading reel stand is additionally provided with the machine, The output of machine is approximately 50 rft per minute. Additionally, our machines are provided with the option of attaching it with paper reel to sheet cutting machine for better accuracy. The vertical model is sturdy in construction, simple to operate and easy to handle. The flute roller, mounted on roller bearing for smoother running and longer life, impart the proper impression on the board. The machine is provided with manual operated twin shaft reel stand. The Heaters are provided for the appropriate conversion of paper to 2-ply. High Speed Rotary Sheet Cutting Machine is perfectly built and designed to increase the production and fine cutting of corrugated board without damaging the flutes of the board as well as plain paper. 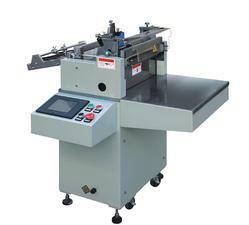 This machine is an perfect alternative to Hand operated Board Cutting Machine. This machine comes with a two way option —to either use the machine as an independent unit or it can be also attached with the corrugation machine to synchronise. P.I.V Gear Box is provided to ensure accurate cutting of the sheet as per required length and easy to adjust and operate. Delivery Conveyor Stand is provided to carry the sheets. A counting meter is also attached with the same to count the respective number of sheets.